Kedar Chandrayan has more than eight years of experience in building scalable and robust back-end technologies. He has a habit of asking questions and understanding the “why” of a product or service before he builds it. He earned a bachelor’s in electrical engineering and a master’s in communications and signal processing from IIT Bombay. I grew up in Maharashtra, India. I attended the Indian Institute of Technology in Bombay and received a bachelor’s in electrical engineering and a master’s in communications and signal processing. I worked as a software developer in Bangalore for about four years. I then founded Foodtang, an online food-delivery service. We worked on it for one year but had to close the project. Overall, it was a very awesome experience and I learned a lot. I joined Hem as a lead software engineer before working on Pepo. 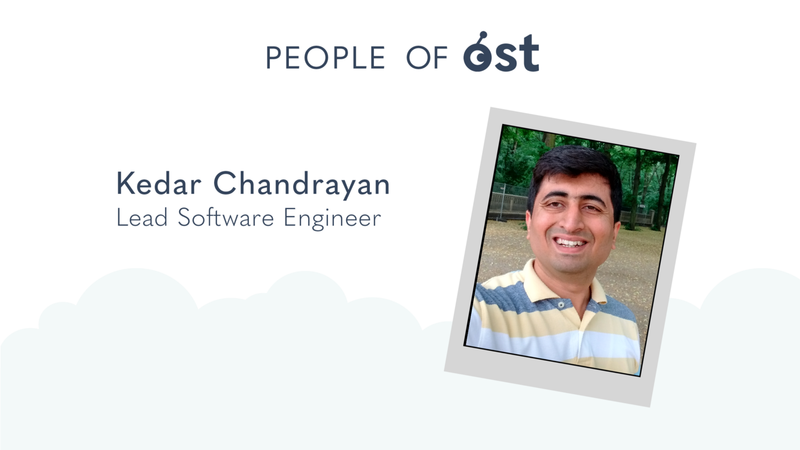 Now I work as a lead software engineer at OST. What piqued your interest in blockchain technology? What drives my interest in blockchain is it’s transparent and immutable nature. You don’t have to know about the party you are dealing with because everything is encoded in a smart contract and you can trust the code because it is mutable. That’s why I believe blockchain technology will be very helpful and will evolve in the future. Even in consumer applications, there can be multiple uses for this technology. In the Pepo days we were solving for user retention. We thought about incentivizing users with tokens. We explored blockchain for that incentive and the advantage we had was that microtransactions can allow users to send even one cent worth of tokens on the blockchain. The problem of retention can be solved using blockchain and tokenization. It was a very large problem for Pepo. We thought about solving this issue for any arbitrary use case, and that led to OST. We have solved this problem for anyone. Any consumer app can set up an economy on OST and get the economy up and running fairly quickly. Businesses can transact and program multiple actions in their economy. What does your role as lead software engineer at OST entail? I manage a team of nine, including myself. More than half are junior engineers, so I have to switch hats between mentoring and coaching. I’m blessed with a very hard-working and talented team of self-starters who are always ready for a challenge. On a day-to-day basis, we solve problems related to scaling and usability. I’m involved in figuring out the best solution for scalability problems. I break down complex problems into simple steps that the team can work on to advance the project as a whole. What are some of the biggest challenges in blockchain? Two major challenges in blockchain are scalability and usability. If you want to use blockchain for consumer applications, you cannot assume that users will be aware of blockchain concepts. Users need a frictionless user experience. The back-end of the application should be very robust to provide a seamless UX. It should be very easy for the user to use the technology. The second challenge is scalability. The scale required by ay mainstream consumer application is far more than that what Ethereum can currently handle. This problem must be solved. We are building a layer over Ethereum clients to provide a frictionless experience for the end user. What has been your most rewarding or favorite project? The most interesting project that I have worked on is OST KIT. If you go to kit.ost.com, you can easily set up your token economy, create your actions, define transactions, and much more. Branded Tokens can be transferred between between users and companies. KIT embodies our solutions to blockchain’s usability and scalability challenges. Currently we can support hundreds of transactions per second. We can also have multiple chains, which would allow hundreds of transactions per second per chain. We are constantly working on improving the technology. Be sure to check out last week’s interview with OST business development manager Marina Antonova. Subscribe to our YouTube channel or listen to the audio format anywhere you listen to podcasts, including iTunes, Stitcher, and Spotify. We’re also now available on Alexa! Simply add “OST LIVE” to your flash briefing.